Just got back from the ELF 2009 convention in Warsaw Poland. A great event! I did follow quite a few classes as the schedule had some interesting topics. And besides meeting old friends I made quite some new ones too. Not to mention my collection of tools also grew considerably (and my wallet is empty). I will share with you these hand made hobb’s picks, used to manipulate (simple) lever locks. The most interesting tools are the one with three handles. I do not even now what specific lock these ‘three in one’ picks are used for, but I do like the technique used to make them. 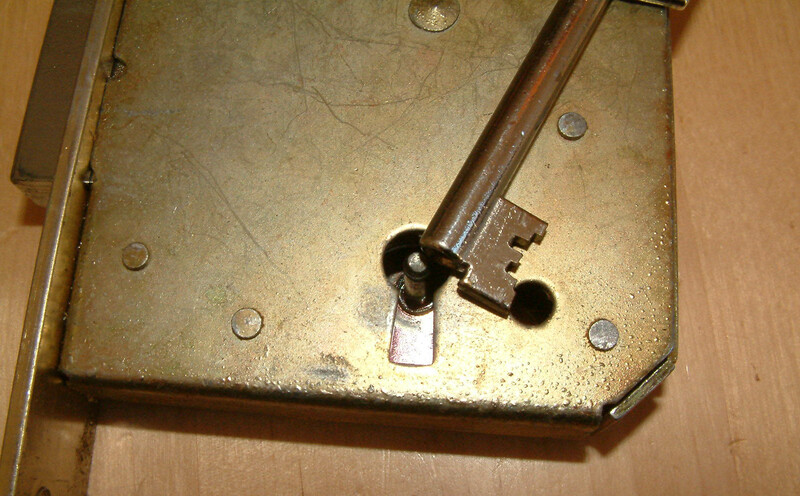 I wrote in a previous posting about the popular orenco lock in spain that uses a simple yet effective countermeasure against a classical hobb’s pick. It seems the kind of pick shown above will be able to open these kind of locka because of the shape of the fingers/tensioner. Although I still I wonder why it is ‘three in one’? Is the middle feeler used to tension the lock? Anyone got an idea what kind of lock this pick was designed for? The other hobb’s picks are regular ones that vary in diameter and shape, but nothing special. This entry was posted on Tuesday, May 19th, 2009 at 00:35 and is filed under Uncategorized. You can follow any responses to this entry through the RSS 2.0 feed. You can leave a response, or trackback from your own site. Your ‘three in one’ picks are used for locks where there is warding which prevents ‘two in ones’ being able to pick up the end levers. By making an ‘L’ shape, the warding can be bypassed. The third pickup is required to pick the last lever which could not be reached by the middle ‘L’ pickup. The ones I’ve made have a reversed ‘L’ pickup in place of the straight one shown in your pictures because warded locks often have wards on the front and back of the lock case. For example BODA lever locks are tensioned from the middle, so the 3-in-1 picks could be used on those easily. Hope they used permanent thread lock on the Gerda escutcheon. Are those Pozidriv, or are they just stripped? any idea of where they can be bought? have u gog a link to the 3 in 1 Hobbs picks? It is for a safe lock with a key post and warding at the back of the post. Swedish standard department lever locks use the same type of ward as Pete C posted a drawing to. But the Swedish locks use both outer and inner ward. This is made by pressing a collar in the sheet metall. Also is the levers designed to make it extremly hard to move a hoobs pick in there, if any lever has been lifted. For this kind of lock you can expect a “four in one” hoobs pick. Sorry – the above picture link is wrong! I have just noticed that in your blogg ‘Back from Spain’ you show (and describe) an Orenco lock. This is exactly the type of lock your 3 in 1 picks were made for! A UK locksmith makes 3 in 1 picks, the 3 in 1 significantly improves control over tension, it allows you to ‘feather’ the tension very well. safe engineers and locksmiths only. The seal you show here is similar to ones that I first saw many years ago on a soviet submarine and later saw in a disused soviet barracks in east germany. The ones I saw were made with a piece of string nailed to the door frame and a clay filled beer bottle top nailed to the door. the impressions in the clay seemed to have been made with some thing like a signet ring or similar. A very effective and cheap tamper seal. « Viola … sweet activist! Entries (RSS) and Comments (RSS). 52 queries. 0.745 seconds.